At thirteen, I was diagnosed with chronic fatigue syndrome. At first, I patiently waited for my doctor to give me medicine. When he didn’t, I patiently waited (for several years) for someone to find the cure. As the years went on I wasn’t getting any better. Though I went to my doctors than I could count, none had any new advice for me, and the medical community wasn’t any closer to figuring out how to heal this illness. Life was unpredictable. I didn’t know what I’d be able to do each day, let alone in the future. Some days I could lead a relatively normal life, going to class and hanging out with friends—as long as we didn’t do anything too active. Some days I could barely get out of bed to go to the bathroom. I had always been ambitious growing up. I loved playing sports, I wanted to be a writer, I wanted to travel the world. As I got into my early twenties, I started questioning if I’d be able to achieve any of these goals when my health was so unpredictable. I had managed to finish high school and attend university. But attending classes and trying to write essays with brain fog was a challenge for which my grades would suffer. When I was twenty-one I had a big crash. I couldn’t attend any classes or do any work. I couldn’t do my laundry or cook dinner. All I could do was survive. I hadn’t sought help from a doctor in many years; they had been so disappointing when I was younger. But now I knew I needed help. I found a holistic health center where I saw an occupational therapist, a nutritionist, a counselor, and a doctor. It’s also where I got my first taste of yoga and meditation. Yoga and meditation helped me embrace the unpredictableness of my health. Before beginning my yoga practice, I was searching for assurance. I wanted a doctor to know what to do. I wanted a medication that would make my symptoms go away. I wanted to know that I could get well and stay well. I wanted an assurance that didn’t exist in reality. Waiting for this assurance had held me back from seeking a partial recovery or recovery on my own. As my yoga and meditation practice advanced I became better tuned to my body and learned what energized me and what made me feel worse. But the most important concept I learned from my studies was impermanence. Sure, my energetic days didn’t last as long as I hoped. But my fatigued days didn’t last as long as I had feared. I began to ride this impermanence like the waves I ride when floating in the sea (which was all I could manage to do when I was very ill, despite swimming competitively when growing up). Doctors told me to “drink a coca cola at lunch” if I felt tired. They told me that I needed to do everything I could to finish my school assignments and get to classes so I didn’t get left behind. But all of this pushing was exhausting. Like trying to swim against the current, it didn’t serve me to try to do what my body would not allow at the times when I was feeling very ill.
As anyone with a chronic illness can tell you, good days come with fear. I used to try to do everything I possibly could on the days I was feeling well because I didn’t know when I’d get a chance to catch up on everything I needed to do (including laundry and school papers but also fun things like getting coffee with a friend). Every time I got better, I waited to get worse again. Yet I came to realize that I didn’t apply this logic when I was feeling my worst. When I was feeling terrible I wasn’t waiting for it to get better; I was in bed feeling sorry for myself and fearing it would get worse. When I began to see the fallacy in this way of thinking, things started changing for me. When I had a bad day, I allowed myself to rest without wallowing. It was frustrating if I had a looming deadline or social event I wanted to go to that I couldn’t meet. But setting those boundaries for myself was invaluable. I didn’t need to ‘push through it’ because I’d get another chance. I could take that course again, or reschedule with my friend. This state of being bedridden was not forever. But it was a time for me to rest, to practice meditation or a gentle yoga session. A time for me to read books that brought me joy, a time to search inward for peace, acceptance, and joy. Understanding that the only thing that’s permanent is change helped me to accept my illness. It helped me end fatalistic thoughts like “I’ll never be able to achieve my dreams,” which seemed reasonable at the time but weren’t helpful to my recovery, or to achieving those dreams. Learning how to ride this impermanence has helped me achieve more than I thought was possible. I was able to graduate university, work full time, travel around the world, and even take part in triathlons! When going through a hard time, it’s easy to feel defeated. It’s easy to feel like there’s no hope, and that our lives are irrevocably changed. But by embracing that change, by knowing that our lives will always change and that nothing will last forever, we can better overcome adversity. If you’re going through a hard time right now, I encourage you to use this time to listen to your body and what it needs. As you start to do this, you’ll start to notice that things change from day to day. One day you might have a searing pain in your head. The next it may be a dull throb. The next, only a faint whisper of the pain before coming back to a searing pain again. Instead of feeling downtrodden that pain has returned, embrace that it has changed. That this state of pain—whether it is emotional or physical—is not a permanent state. Embracing impermanence has shifted every area of my life. I’m a freelance writer, which means I don’t have a set salary. Some months can go well and others…not so much. But I don’t get stuck in the bad months because I know it will change again. I still have bad health days, but I know the healthy energetic days far outweigh the bad, and I’m able to take the bad days as they come. For those of us who are chronically ill, it’s easy to feel like healthy people feel great every day. They don’t. They have bad days as well. But dwelling on the number of bad days or bad feelings won’t make them go away any faster, just as trying to cram everything you can into a good day won’t make the good day last any longer. As you become in tune with the rhythms of your body and better attuned to the way your body changes, you’ll learn how to better nourish yourself. Watch as you move between pain and no pain, fatigue and energy and enjoy the time of much-needed rest as much as those of activity. Keep a journal and record how you feel each day. Review this journal at the end of each week so you can see how much change you face even in just a week. Start a daily mindfulness practice. This can be yoga and meditation, but it can also be another mindful activity such as walking or taking a hot bath. Anything that helps you tune into your body and mind and assess the rhythms of your thoughts, pain, and energy levels. This will help you keep an accurate journal, and see how things can change even from breath to breath. Commit to eliminating fatalistic thinking—thoughts that contain information you could not possibly know. Thoughts like “I’ll always be in pain” or “I’ll never get better” when you have no idea what the future holds are examples of fatalistic thinking. Write down those thoughts in a diary and then write the truth next to them. For example, “I’m in pain right now,” or “I don’t feel well today.” None of us can tell the future; don’t let your mind trick you into thinking that it can. And lastly, take rest when you need rest, and find a moment of joy in every day. Kayla helps people living with chronic illnesses find relief through yoga. Her goal is to make yoga accessible so that people of all abilities can participate in her classes from around the world. Learn more about her work at arogayoga.com or check out her new book, Yoga for Chronic Pain: 7 Steps to Aid Recovery from Fibromyalgia Through Yoga. 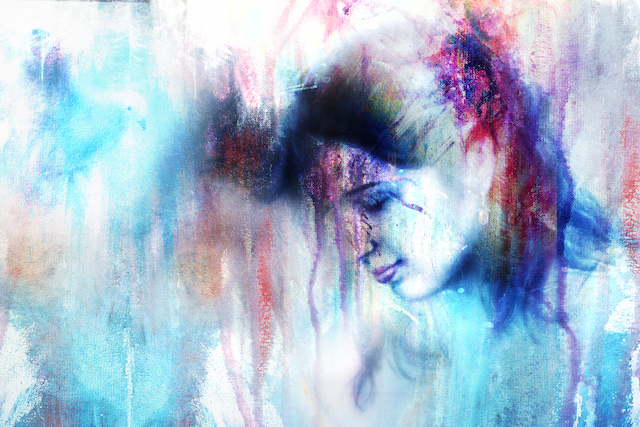 The post Pain Is Never Permanent: Lessons from Living with a Chronic Illness appeared first on Tiny Buddha.